Good evidence suggests that early treatment delays or prevents the onset of diabetic nephropathy or diabetic kidney disease. This has consistently been shown in both type 1 and type 2 diabetes mellitus. (See Treatment and Management). Recently, attention has been called to atypical presentations of diabetic nephropathy with dissociation of proteinuria from reduced kidney function. Also noted is that microalbuminuria is not always predictive of diabetic nephropathy. Nevertheless, a majority of the cases of diabetic nephropathy presents with proteinuria, which progressively gets worse as the disease progresses, and is almost uniformly associated with hypertension. Go to Diabetes Mellitus, Type 1 and Diabetes Mellitus, Type 2 for more complete information on these topics. Three major histologic changes occur in the glomeruli of persons with diabetic nephropathy. First, mesangial expansion is directly induced by hyperglycemia, perhaps via increased matrix production or glycation of matrix proteins. Second, thickening of the glomerular basement membrane (GBM) occurs. Third, glomerular sclerosis is caused by intraglomerular hypertension (induced by dilatation of the afferent renal artery or from ischemic injury induced by hyaline narrowing of the vessels supplying the glomeruli). These different histologic patterns appear to have similar prognostic significance. 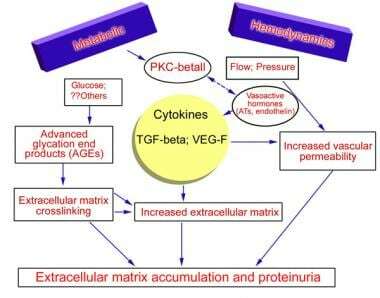 The key change in diabetic glomerulopathy is augmentation of extracellular matrix. The earliest morphologic abnormality in diabetic nephropathy is the thickening of the GBM and expansion of the mesangium due to accumulation of extracellular matrix. The image below is a simple schema for the pathogenesis of diabetic nephropathy. Light microscopy findings show an increase in the solid spaces of the tuft, most frequently observed as coarse branching of solid (positive periodic-acid Schiff reaction) material (diffuse diabetic glomerulopathy). Large acellular accumulations also may be observed within these areas. These are circular on section and are known as the Kimmelstiel-Wilson lesions/nodules. Immunofluorescence microscopy may reveal deposition of albumin, immunoglobulins, fibrin, and other plasma proteins along the GBM in a linear pattern, most likely as a result of exudation from the blood vessels, but this is not immunopathogenetic or diagnostic and does not imply an immunologic pathophysiology. The renal vasculature typically displays evidence of atherosclerosis, usually due to concomitant hyperlipidemia and hypertensive arteriosclerosis. Electron microscopy provides a more detailed definition of the structures involved. In advanced disease, the mesangial regions occupy a large proportion of the tuft, with prominent matrix content. Further, the basement membrane in the capillary walls (ie, the peripheral basement membrane) is thicker than normal. The severity of diabetic glomerulopathy is estimated by the thickness of the peripheral basement membrane and mesangium and matrix expressed as a fraction of appropriate spaces (eg, volume fraction of mesangium/glomerulus, matrix/mesangium, or matrix/glomerulus). The glomeruli and kidneys are typically normal or increased in size initially, thus distinguishing diabetic nephropathy from most other forms of chronic renal insufficiency, wherein renal size is reduced (except renal amyloidosis and polycystic kidney disease). In addition to the renal hemodynamic alterations, patients with overt diabetic nephropathy (dipstick-positive proteinuria and decreasing glomerular filtration rate [GFR]) generally develop systemic hypertension. Hypertension is an adverse factor in all progressive renal diseases and seems especially so in diabetic nephropathy. The deleterious effects of hypertension are likely directed at the vasculature and microvasculature. Evidence suggests that hypertension associated with obesity, metabolic syndrome, and diabetes may play an important role in the pathogenesis of diabetic nephropathy. Central obesity, metabolic syndrome, and diabetes lead to increased blood pressure. Central obesity induces hypertension initially by increasing renal tubular reabsorption of sodium and causing a hypertensive shift of renal-pressure natriuresis through multiple mechanisms, including activation of the sympathetic nervous system and renin-angiotensin-aldosterone system, as well as physical compression of the kidneys. Hypertension, along with increases in intraglomerular capillary pressure and the metabolic abnormalities (eg, dyslipidemia, hyperglycemia) likely interact to accelerate renal injury. Similar to obesity-associated glomerular hyperfiltration, renal vasodilation, increases in the glomerular filtration rate and intraglomerular capillary pressure, and increased blood pressure also are characteristics of diabetic nephropathy. Increased systolic blood pressure further exacerbates the disease progression to proteinuria and a decline in the glomerular filtration rate, leading to end-stage kidney disease. Glycemic control reflects the balance between dietary intake and gluconeogenesis and tissue uptake or utilization through storage as glycogen or fat and oxidation. This balance is regulated by insulin production from the β cells in the pancreas. Insulin regulates serum glucose through its actions on liver, skeletal muscle, and fat tissue. When there is insulin resistance, insulin cannot suppress hepatic gluconeogenesis, which leads to hyperglycemia. Simultaneously, insulin resistance in the adipose tissue and skeletal muscle leads to increased lipolysis and reduction in disposal of glucose causing hyperlipidemia in addition to hyperglycemia. Evidence suggests that when there is insulin resistance, the pancreas is forced to increase its insulin output, which stresses the β cells, eventually resulting in β-cell exhaustion. The high blood glucose levels and high levels of saturated fatty acids create an inflammatory medium, resulting in activation of the innate immune system, which results in activation of the nuclear transcription factors-kappa B (NF-κB), and release of inflammatory mediators, including, interleukin (IL)–1β and tumor necrosis factor (TNF)–α, promoting systemic insulin resistance and β-cell damage as a result of autoimmune insulitis. Hyperglycemia and high serum levels of free fatty acids and IL-1 lead to glucotoxicity, lipotoxicity, and IL-1 toxicity, resulting in apoptotic β-cell death. Familial or perhaps even genetic factors also play a role. Certain ethnic groups, particularly African Americans, persons of Hispanic origin, and American Indians, may be particularly disposed to renal disease as a complication of diabetes. It has been argued that the genetic predisposition to diabetes that is so frequent in Western societies, and even more so in minorities, reflects the fact that in the past, insulin resistance conferred a survival advantage (the so-called thrifty genotype hypothesis). Since the 1950s, kidney disease has been clearly recognized as a common complication of diabetes mellitus (DM), with as many as 50% of patients with DM of more than 20 years’ duration having this complication. Diabetic nephropathy rarely develops before 10 years’ duration of type 1 DM (previously known as insulin-dependent diabetes mellitus [IDDM]). Approximately 3% of newly diagnosed patients with type 2 DM (previously known as non–insulin-dependent diabetes mellitus [NIDDM]) have overt nephropathy. The peak incidence (3%/y) is usually found in persons who have had diabetes for 10-20 years, after which the rate progressively declines. The risk for the development of diabetic nephropathy is low in a normoalbuminuric patient with diabetes’ duration of greater than 30 years. Patients who have no proteinuria after 20-25 years have a risk of developing overt renal disease of only approximately 1% per year. In terms of diabetic kidney disease in the United States, the prevalence increased from 1988-2008 in proportion to the prevalence of diabetes. Among people with diabetes, the prevalence of diabetic kidney disease remained stable. Striking epidemiologic differences exist even among European countries. In some European countries, particularly Germany, the proportion of patients admitted for renal replacement therapy exceeds the figures reported from the United States. In Heidelberg (southwest Germany), 59% of patients admitted for renal replacement therapy in 1995 had diabetes and 90% of those had type 2 DM. An increase in end-stage renal disease (ESRD) from type 2 DM has been noted even in countries with notoriously low incidences of type 2 DM, such as Denmark and Australia. Exact incidence and prevalence from Asia are not readily available. Diabetic nephropathy affects males and females equally. The severity and incidence of diabetic nephropathy are especially great in blacks (the frequency being 3- to 6-fold higher than it is in whites), Mexican Americans, and Pima Indians with type 2 DM. The relatively high frequency of the condition in these genetically disparate populations suggests that socioeconomic factors, such as diet, poor control of hyperglycemia, hypertension, and obesity, have a primary role in the development of diabetic nephropathy. It also indicates that familial clustering may be occurring in these populations. By age 20 years, as many as half of all Pima Indians with diabetes have developed diabetic nephropathy, with 15% of these individuals having progressed to ESRD. Diabetic nephropathy accounts for significant morbidity and mortality. Proteinuria is a predictor of morbidity and mortality. (See Workup.) The overall prevalence of microalbuminuria and macroalbuminuria in both types of diabetes is approximately 30-35%. Microalbuminuria independently predicts cardiovascular morbidity, and microalbuminuria and macroalbuminuria increase mortality from any cause in diabetes mellitus. Microalbuminuria is also associated with increased risk of coronary and peripheral vascular disease and death from cardiovascular disease in the general nondiabetic population. Patients in whom proteinuria has not developed have a low and stable relative mortality rate, whereas patients with proteinuria have a 40-fold higher relative mortality rate. Patients with type 1 DM and proteinuria have the characteristic bell-shaped relationship between diabetes duration/age and relative mortality, with maximal relative mortality in the age interval of 34-38 years (as reported in 110 females and 80 males). ESRD is the major cause of death, accounting for 59-66% of deaths in patients with type 1 DM and nephropathy. In a prospective study in Germany, the 5-year survival rate was less than 10% in the elderly population with type 2 DM and no more than 40% in the younger population with type 1 DM. The cumulative incidence of ESRD in patients with proteinuria and type 1 DM is 50% 10 years after the onset of proteinuria, compared with 3-11% 10 years after the onset of proteinuria in European patients with type 2 DM. Although both type 1 and type 2 DM lead to ESRD, the great majority of patients are those with type 2 diabetes. The fraction of patients with type 1 DM who develop renal failure seems to have declined over the past several decades. However, 20-40% still have this complication. On the other hand, only 10-20% of patients with type 2 DM develop uremia due to diabetes. Their nearly equal contribution to the total number of patients with diabetes who develop kidney failure results from the higher prevalence of type 2 DM (5- to 10-fold). Cardiovascular disease is also a major cause of death (15-25%) in persons with nephropathy and type 1 DM, despite their relatively young age at death. Patient education is key in trying to prevent diabetic nephropathy. Appropriate education, follow-up, and regular doctor visits are important in prevention and early recognition and management of diabetic nephropathy. For excellent patient education resources, visit eMedicineHealth’s Diabetes Center. In addition, see eMedicineHealth’s patient education article Diabetes Mellitus.